Death and the City is a roleplay exercise for young people aged 11 and older. 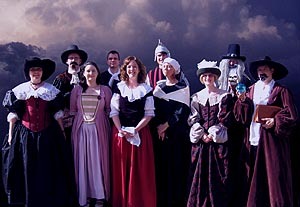 Drawing on a real-life outbreak of plague in the city of York in 1631, the piece casts its audience in the role of city aldermen who interrogate a series of characters acted by volunteers. In doing so, they begin to uncover seventeenth-century attitudes to disease, medical practice, and the role of social standing and religion. Interview (audio and transcript) with Sabine Clarke and James Sumner for The Naked Scientists podcast and BBC Radio shows, recorded at the 2007 BA Festival. For more information about Death and the City, or to express interest in arranging a presentation, please contact Sabine Clarke at [email protected].